160M is one of Joe's favorite bands. During contests he can always be found scanning 160M at the top of each hour to grab a new mult or two. Every time he does he enjoys a small personal victory. In DX contests 160M is really a mult band at NK7U. It is not practical to try to run it from our part of the country as there are not enough stations to make it worthwhile. The possible exception being running JA on CW. In 160M contests or other contests which allow stateside contests though, NK7U will be found with one of the big west coast signals. During the CQ 160M SSB contest in 1997 at the old QTH K7ZO and W7ZRC using a single elevated ground plane made 897 Q's and set the Zone 3 Multi-op record. NK7U's current 160M antenna is a 1/4 wavelength elevated ground plane hung from the East tower. This is a temporary antenna until he gets all the towers and yagis up in the air. Then he will get something better up and hopefully with some gain. Currently he has a design for a 4 element sloper array to be hung from the back tower. We ran out of good weather in the Fall of 2003 to get it up, but it is on the list for 2004. We also hope to get up some beveridges for listening. Here is the feedpoint for the 160M ground plane. That is the coax heading off to the left, the antenna going up and to the left and the radials off to the right. Here you can see the feedpoint for the ground plane, the coax and the radials. You can't and the antenna itself in this picture but you can see how it has been pulled out from the tower. 80M is probably Joe's favorite band these days. It offers both the reasonable potential of QSO's in far flung places along with that special challenge of being in the right place at the right time and having the right hardware assisting you in the effort. It is also possible to get a run going on 80M in DX contests for us on the west coast, notably into Japan, in addition to the usual S&P mult hunting. Joe also likes hanging out on 80M during the off contest times listening for rare RX. If you want to catch Joe on the air your best bets is usually on 80M. Joe has always believed in big antennas for 80M. At his past two QTH's this has included his famous 3 element beam. Most recently this was on top of a 180' AB-105 tower turned by a massive prop pitch motor. As we were relocating Joe's station in the summer of 2002 the 80M was the last one to be taken down. However, the day before we were scheduled to do it a microburst rolled across the valley and ripped off half of the driven element. The broken piece landed about 400' away from the tower indicating this was one heck of a wind that hit it. This beam was totally rebuilt and upgraded during the summer of 2003 with the latest mods from Mike Staal and was put back up in the air during the 2003 antenna season. Joe has also talked about putting up a 80M 4-square and some beveridges. The first 80M antenna we put up Joe's current QTH is a rotating dipole at 135'. This antenna started life as a F12 160M rotating dipole. 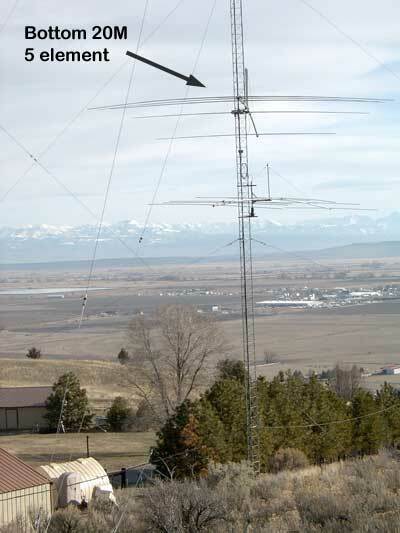 At his previous QTH Joe put this up on top of the 190' Rohn 45 tower containing his 4 stack of 5 element 20M beams for Europe. Unfortunately the antenna did not even last through one winter season and became a tangled mess of wire and tubing that took a whole day to bring down from the tower. Mike Staal helped Joe design this into an 80M rotating dipole and this is what is now up. It seems to play well, though it is tuned a bit low for the SSB sub-band and we will bring it down and retune it during the 2004 antenna season. During both CQ WW SSB 2002 and ARRL SSB 2003 we got nice JA runs going with it obtaining many 59+ comments. 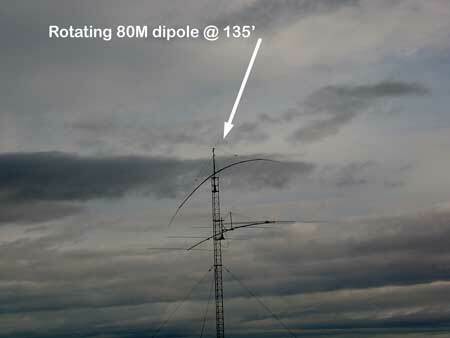 This is the 80M rotating dipole. 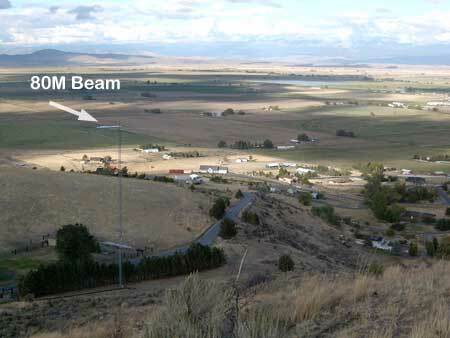 Below it is a 6 element 15M beam for size comparison. 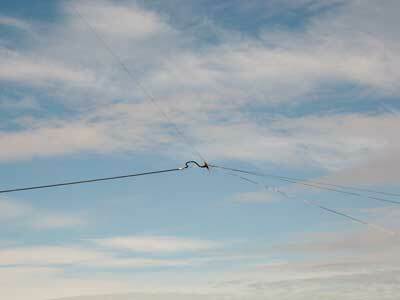 The total length of the 80M dipole, from tip to tip is 75 feet. You may wonder how you get an almost straight on shot of an antenna at 135 feet? Well this picture was taken by climbing the hill behind the tower. By climbing higher it would be possible to take a picture looking down on it! This beam is Joe's pride and joy and clearly represents the largest investment in time and money of any antenna in Joe's arsenal. Right now it is up at 140' on top of an AB105 tower and is turned by a very large prop pitch. 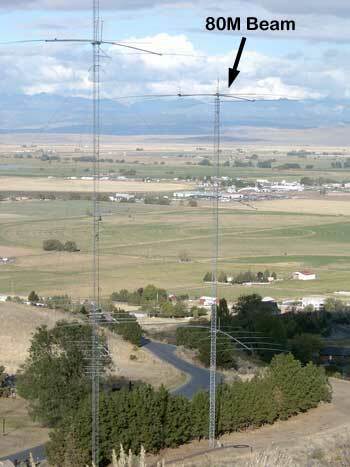 This is not high for an 80M beam but the tower sits at the edge of an incredible dropoff from the Southeast through Northwest as can be seen in the pictures below. This photo shows both the East and the 80M tower. The 80M tower is on the right and you can see the 3 element 80M on top at 140'. Both 6 element 20M beams can be seen as well. This photo shows the 80M tower in the left of the photo and you can see the 80M beam on top. This shows why the beam only being at 140' is not a large issue as the ground slopes off very nicely. The valley floor is 400' below the tower base! 40M contest operation at NK7U has two main modes to it. First is very active S&P multing into Europe, Caribbean, South America, and Africa. The second mode is running JA's during the late evening though dawn period. During one memorable ARRL DX SSB contest, in 1998, we worked 325 JA's on 40M at the old QTH. From the west coast we have never really been able to run Europe on 40M SSB. A couple weekends before 2003 CQWW during a non-contesting checkout there was a great 40/80M short path opening to Europe. During that opening K7ZO easily worked a dozen or so stations on 40M SSB with 59+ reports both ways. So the antennas clearly are capable of getting a runnable signal into Europe. And in 2003 ARRL SSB and CQWW SSB KL2A and KL9A pulled off some short runs totaling 10-30 stations. We are sure running Europe on CW would be easy but there has not been much CW operation from NK7U in recent years. NK7U's currently has two independently selectable 40M antenna systems. 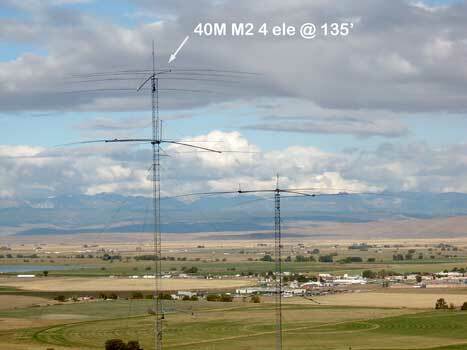 One is a single new 4 element M2 at the top of a 135' Rohn 45 tower turned by a Tailtwister. It is fed via a 230' run of RG-213. The other is a 4/4 stack of aging KLM's fixed on Europe at 160' and 70'. The stack is located on the Back tower which is 170' of AB105. We have never had two independently selectable 40M beams at NK7U. Having this flexibility will give us some opportunities in contests we have never had before -- notably in multi-op NAQP and Sweepstakes. There is an old saying among the golfers of the world: "You drive for show and you putt for dough". Well, 20M is the tee box of contesting and at NK7U Joe has always believed in getting as much aluminum in the air as he can on 20M. During sunspot cycle minimums everyone congregates onto 20M and you need a big signal to make it through. NK7U will be there with the best of them. The history of 20M at the NK7U QTH's is pretty impressive. At his ranch QTH though 1992 Joe had a 4 stack of 5 element beams fixed on Europe, a 2 stack of long boom 4 element beams fixed on deep Asia, and a rotating 6 element monster on a 60' boom. 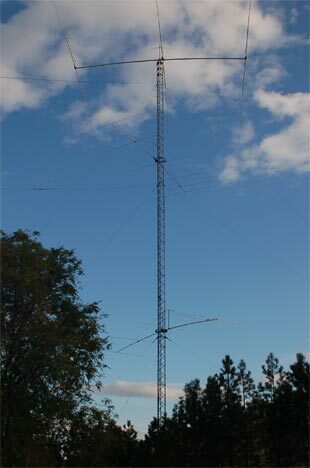 A total of 34 elements on 20M. 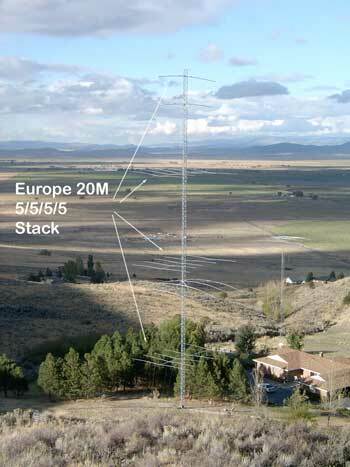 At the next QTH he put up the same Europe stack with the top antenna at 180 feet. He also added a second 6 element monster to create a 2 stack each independently rotatable on TIC rings and selectable via a WX0B box. They were at 60 and 130 feet. A total of 32 elements on 20M. These antennas really got out. K7ZO remembers aiming the 6/6 stack at a CQing station in Italy a few years ago and giving him a call. The comment back was something like: "NK7U you sound like you are in my back yard!" That kind of signal report will beat a "59 14" any day. 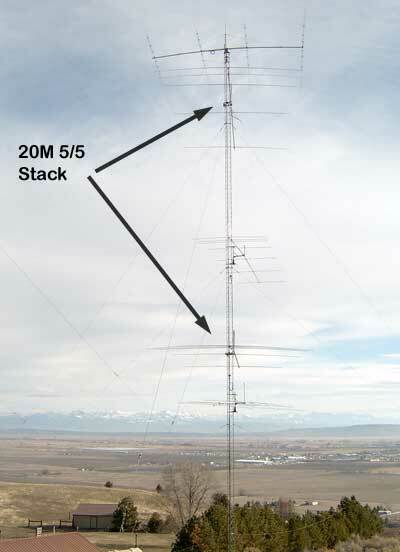 At his current QTH Joe has up three independently selectable 20M stacks with a total of 46 elements! In addition two C31XR multiplier antennas has another 6 for a grand total of 52 elements on 20M. 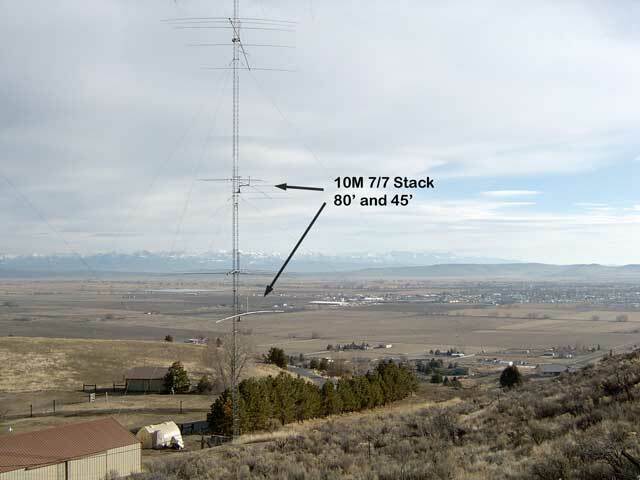 Joe's first 20M antennas up were a rotating two stack of 5 element M2 beams at 60 and 125 feet on the Rohn 45 East tower. Each is independently rotatable on TIC rings and and selectable via a WX0B box. These were the same 4 element long boom antennas used at the ranch that were upgraded by adding a fifth element and converting to a hairpin match feed per a design by Mike Staal at M2. The antenna at the top of the picture is the bottom 5 element 20M beam in the 5/5 stack. When this picture was taken the antenna was aimed at Europe, about 30 degrees heading. Pretty nice terrain in that direction isn't it? This is a view of the East tower containing the 10M 7/7 stack, the 4 element 40 on top and the 20M 5/5 stack. The 2nd and 4th antennas from the bottom are the 20M beams. Each one is on its own TIC ring. The famous Europe 4 stack of 5 element beams is also back as a result of the 2003 construction activities. It is located on the Europe AB105 tower along with the 4/4 40M stack. These are KLM beams with 42' booms that have been optimized on YO for being in a 4 stack. Their heights are 170, 122, 74, and 26 which may seem low but this tower has an incredible takeoff toward Europe. There is an immediate 20' drop and then a long slope extending out 700' or so and then a dropoff to the valley floor. So the effective height on the antennas is a much higher. In 2005 it was discovered that the antennas had originally be pointed about 50 degrees or about 20 degrees too far south for optimum coverage into Europe. So, during the summer of 2005 Joe realigned the stack to a 30 degree heading. To do so he built a short standoff mast system instead of attaching them directly to the tower leg. Photos will be added in the future. Finally are fixed antenna configurations on the Japan towers. On these two tower are a 6/6 of M2 beams on 60 foot booms. These are at 50 and 115 feet fixed on JA. 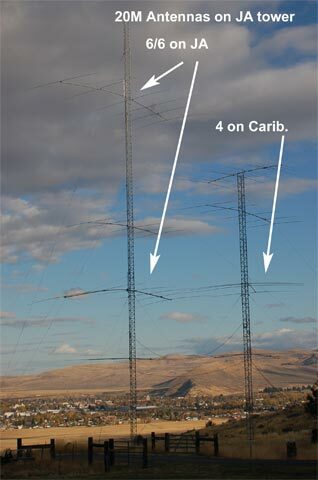 Also on these towers is a 4 element beam fixed on the Caribbean at 50 feet. These three antennas are all fed into a WX0B box. We can choose just the Japan two stack, just the Caribbean antenna or both. Using all three is handy when running JA as the 4 element beam will give us a strong signal back across the US and will help keep people off our frequency. As of October 2005 Joe is getting pretty close to having this configuration in place. The rotating and selectable two stack are 6 element M2 beams on 45' booms. These are mounted on TIC rings at 115 and 60 feet on the tower with the 80M beam. The stack is fed through a WX0B box so each one is individually selectable or the whole stack can be used. This is the 2 stack of 6 element 15M beams. The antenna on top of the tower is the 80M beam. the front of the antenna is a counter weight. Without it the antenna is back heavy and is both hard to put up. 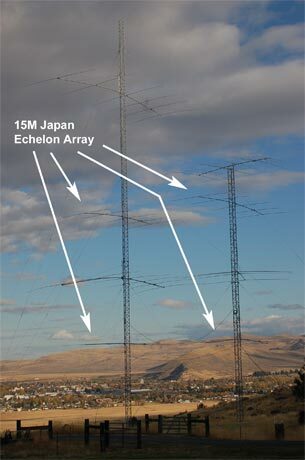 In October 2005 Joe also finished putting up his echelon array on 15M for Japan. The antennas are 5 element M2 beams. Each pair is at 25 and 70 feet high and the antennas are spaced one wavelength apart horizontally -- about 45 feet. The Europe array is going to be more of a hybrid configuration. Joe has three 6 element KLM 15M beams built and ready to go up in the air. Two are going to be on the sidemounts on the west tower giving him a a rotating pair at 75 and 115 feet. To this a third antenna will be fixed at 35 feet on Europe and fed into the same WX0B box. This will give us a 6/6/6 on Europe and another rotating 6/6 to be used wherever needed. This is the next project on the "TO-DO" list. At this spot in the solar cycle 10M is not a high priority. Though having enough antenna to get the openings that do occur is important for the multipliers that result. Right now Joe has up a 7/7 rotating stack. For many stations this would be a pretty good setup. For NK7U though this is pretty basic. These antenna are on 45' booms and are sidemounted at 80' and 45' on the Rohn 45 East tower. They are individually rotatable and selectable via a WX0B box. Per the note on the 15M page we are looking at eventually getting a 4 stack up on 10M to Europe. 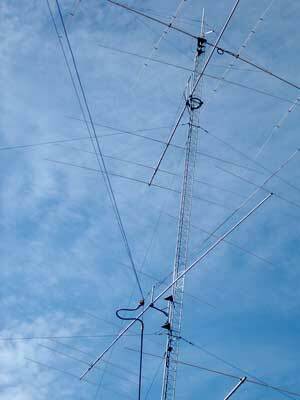 And, for JA we may use the same towers used for 15M to put up a 10M JA echelon stack as well. Joe used this arrangement before with good success.